No strings (or wires) attached. Introduced more than a decade ago by the FAA, ADS-B (Automatic Dependent Surveillance-Broadcast) provides weather and traffic information to all aircraft equipped with an ADS-B receiver, such as the Dual XGPS-190, subscription-free. The portable Dual XGPS-190 receiver provides ADS-B weather and traffic to FlyQ EFB (sold separately) for display on an iPad. 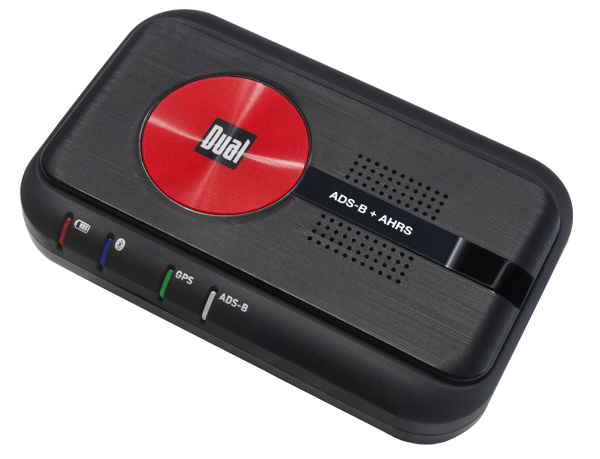 The Dual XGPS-190 also receives traffic information on the 978 (ground to air) frequency for local traffic coverage and 1090 (air to air) for the widest possible coverage area. FlyQ EFB displays this traffic using intuitive colors that signify threat levels, future-position lines so you can understand where the targets will be in 2 minutes, and an optional filtering system to remove targets that pose no threat so you can focus on ones that might. The XGPS-190 includes a WAAS GPS receiver with fast location acquisition (under 30 seconds), with position updates up to 10 times per second. The GPS location information is wirelessly transmitted via Bluetooth to the iPad. FlyQ EFB has a tremendous 3D synthetic vision mode. All it needs to come alive is an AHRS that feeds it accurate yaw, pitch, and roll data. The XGPS 190 has you covered with a great AHRS. ADS-B traffic is broadcast from ground stations on 978 Mhz and from air-to-air on 1090 Mhz. The XGPS 190 is a dual channel system that receives traffic from both channels, giving you a more complete traffic picture. The XGPS-190 wirelessly sends GPS and ADS-B data to up to two iPad devices simultaneously, leaving each iPad free to connect to other wireless devices via Bluetooth or WiFi. Because the XGPS-190 uses Bluetooth, the WiFi connection on your iPad is left free for other uses, such as connecting to the Internet (for weather services, flight plan updates, etc.) or to another accessory. There are no hassles with switching between networks and no service interruptions. It takes less than a minute to pair your iPad with the Dual XGPS-190 and the receiver will remember your iPad the next time you want to use it. Ships via UPS or USPS. Please allow 7-10 days for delivery. International (non-US) shipping not available at this time. Please email CustomerService@SeattleAvionics.com if you have any questions.